Establishing independent playtime can be a great gift to both children and parents. It allows the child to learn to entertain themselves and also provides a wonderful environment for experimental learning, since mom and dad aren’t there to help them out. For the parents, independent playtime means a break in the day that they can use to accomplish any number of things (or accomplish nothing by cruising the internet the whole time- not that I’ve ever done that), knowing full well that their child is in a safe environment. We started Brandon out with independent play when he was only a few months old, and now at 2 years, he will play happily by himself for up to an hour in his room (he might actually go longer, but that’s the longest I’ve ever kept him in there). On most days, we do two 30-minute sessions – once while I’m showering in the morning and once in the evening while I’m cooking dinner. He actually looks forward to it, and is more well behaved on days when he gets some time alone. We started Rylan out early as well, and now at nearly 6 months, he does 15-minutes on a blanket while I prep lunch, and 30-minutes in a playpen while I cook dinner. Start Early – I know it’s hard to part with your little love in the first weeks they are home from the hospital, but as soon as you can stand it, leave them alone on a playmat (or under a mobile in the crib – just need something for them to look at) for a few minutes at a time, several times during the day. They may fall asleep during these early weeks (and then you do the happy dance), but as time passes they will become more engaged. Start Small – Try 5 minutes twice a day, then 10 minutes twice a day, etc. until you work up to a point you are comfortable with. The key is getting your baby used to the fact that they don’t need mom and dad there to entertain them all the lit long day. Schedule the Time – If your baby is a little older and has a good routine going, make independent play a regularly scheduled part of your day. Try and do it at a similar time each day, so the baby knows what to expect (they know more than you would think). Create the Space – I currently use a blanket on the floor (over padding) and a playpen. Whatever you use make sure it is safe. If your baby is rolling over, they could easily roll off a blanket, so you have to be sure there is nothing nearby that could be harmful. If I’m going to leave the room at any point, I use the playpen just to be sure. I also use a video monitor if I’m leaving the room. Hide – Your baby will be better able to focus and less likely to call out for you if they don’t see you, but you still need to be able to observe them. Try and keep yourself out of their line of sight, but where you can still safely monitor how things are going. I love a video monitor for this. Make it Fun – Put a mobile on the playpen, some mirrors in the corners, and of course, a few soft toys. 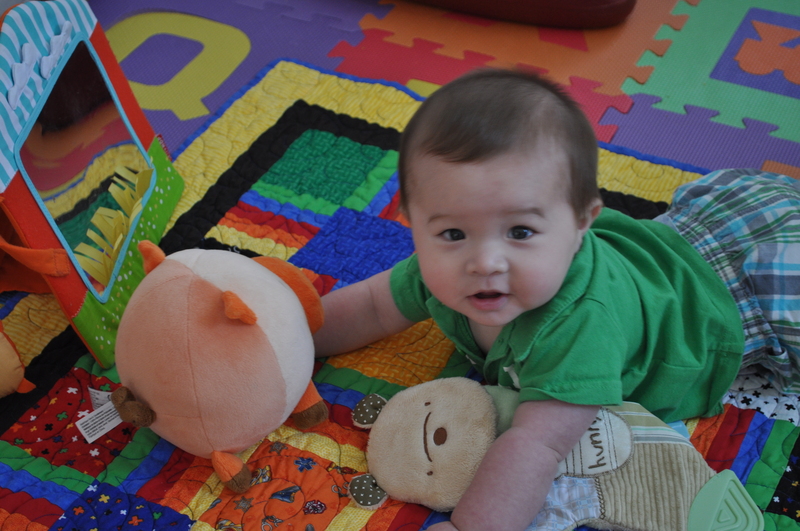 The toys should be things that the baby can explore independently and safely. Be careful to not put too many things at one time though, as you want them to learn to focus and not be over stimulated (which can lead to crankiness very quickly in small babies). Rotate the toys every so often to keep it interesting. Avoid Overuse – Don’t leave your baby in independent play for so long that they become bored and frustrated. This is a time meant to ease them into it, and for their (and your) enjoyment. It’s great to be able to comfortably leave your baby in a playpen while you attend to another child or other emergency, just try not to abuse it. Have you had any luck/problems with independent playtime? Do your kids enjoy it? And don’t forget to comment here with your ideas of a 7-30 day fitness/diet challenge to win a sleek kitchen scale! Posted in Mommy Know How and tagged activities, Baby, independent play, playtime. Bookmark the permalink.